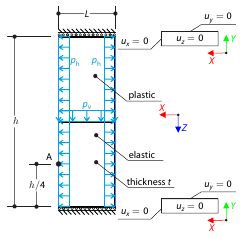 A thick-walled vessel is loaded by such an inner pressure that the vessel reaches an elastic-plastic state. While neglecting self‑weight, the analytical and numerical solutions for the radial position of the plastic zone border (under the Tresca hypothesis) are determined and compared. Determination of the maximum deformation of the wall divided in the middle to the two parts. The upper and the lower part are made of an elasto-plastic and an elastic material respectively and both end planes are restricted to move in the vertical direction. 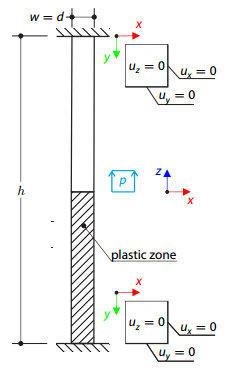 Wall's self-weight is neglected, its edges are loaded with horizontal pressure ph and the middle plane by vertical pressure. A tapered cantilever is fully fixed on the left end and subjected to a continuous load considering plasticity. A cantilever is fully fixed on the left end and subjected to a bending moment on the right end. The material has different plastic strengths in tension and compression. A cantilever is fully fixed on the left end and subjected to a transverse force and an axial force on the right end. 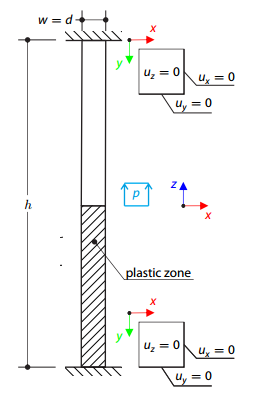 The tensile strength is zero and the behaviour in the compression remains elastic. A cantilever is fully fixed on the left end and subjected to a bending moment considering plasticity. 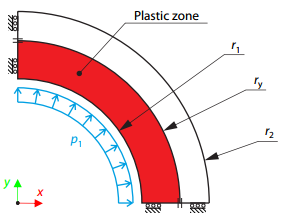 A thin plate is fully fixed on the left end and subjected to a uniform pressure considering plasticity. A three-dimensional block, made of elastic-plastic material with hardening, is fixed on the both ends. The block's middle plane is subjected to the pressure load. The surface of plasticity is described according to the Tsai‑Wu plasticity theory. A three-dimensional block, made of elastic-plastic material, is fixed on the both ends. The block's middle plane is subjected to the pressure load. The surface of plasticity is described according to the Tsai-Wu plasticity theory.